Ray Little hunkers down in the Greenwood creek, grumbling about the icy water gurgling around his boots. With a practiced hand he sloshes water in his gold pan. Quickly, he discards larger chunks of rocks and clay. After a few minutes a crescent of black sand emerges at one side of the pan. "There," he points. "We found some color." Half a dozen minuscule bits of gold reflect the light. 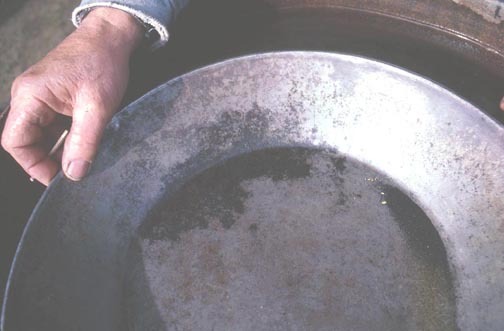 Gold panning is as much a part of the Sierra Nevada foothills as apple pie. Ever since 1848, when James Marshall discovered gleaming nuggets in the tailrace of Sutter's Mill, countless bonanza-seeking prospectors have whirled gravels in their pans. The mother lode that stretches through the Sierra Nevada foothills still hides plenty of gold. Just about any stream hereabouts is apt to produce color, says Ray, who's lived most of his life here. He ought to know. Ray's family owned and worked Slate Mountain Mine, in the Mosquito area, in the late 1930s and early 1940s. He and his family also worked a dredger for about five years. Where to get supplies? Many visitor-oriented businesses carry gold pans, but serious recreational miners will want to get their supplies from a shop wholly dedicated to mining. One source is Auburn's Pioneer Mining Supplies, a premier source of recreational mining supplies, dredges, pans, automatic panners, sieves and more ( 885-1801. The historic Placerville Hardware, 441 Main Street, Placerville (530] 622-1151) is another source. Where to pan? Try Marshall Gold Discovery Site State Park in Coloma ( 622-3470), where volunteers often give summer weekend gold panning demonstrations. Pan here on the east side of the river downstream from the one-lane bridge. A concession at the old Bekeart Store in Coloma also features gold panning. The Yuba River in the northern Sierra Nevadas is a favorite destination. Near Washington, east of Nevada City off Highway 20, one can pan at local campgrounds, in the Tahoe National Forest , Keleher Picnic Area on the Yuba River two miles upstream from town, and Quartz Picnic Area further upstream. Information sheets available at Tahoe National Forest, 631 Coyote St., Nevada City, CA 95959; (530) 265-4531. If you're in the business to make some real money gold mining, get in touch with the Bureau of Land Management, 63 Natomas Street, Folsom, CA 95630; (916) 985-4474. Jamestown in the southern Sierras is another popular gold-panning spot. You also may pan at Auburn State Recreation Area ( 885-4527) along the North and Middle Forks of the American River. Panning is allowed in any portions of the rivers or tributaries except for the Knickerbocker area near Cool. Leave picks and shovels home, and only pan gravels from the running stream bed, not materials from the river or tributary banks. The recreation area is one of the few places where small dredgers are permitted. To dredge, however, miners are restricted to certain areas and must obtain a permit, awarded on a first-come, first-served basis and subject to regulations, from the California Department of Fish and Game ( 445-0411). Pan, too, on the Eldorado National Forest. Check with the Forest Supervisor's office (100 Forni Road, Placerville 95667;  622-5061) for details. With an owner's permission, you may pan on private property; however, Fish and Game regulations restrict excessive disturbance of streams. Prospecting often resulted in some legendary strikes. Sometimes gold-bearing veins of quartz led deep into the earth, and the hard-rock miners followed. Most old mines, now closed, are too dangerous to explore. You can still get visit an underground shaft, however, at Placerville's Gold Bug Mine ( 622-0832). For a small donation, you can take a self-guided tour of the well-lighted and timber-reinforced mine. Check for operating hours. A stamp mill from the Little family’s Slate Mountain mine was recently restored by members of the Growlersburg Conservation Camp and now occupies a place of honor in central Georgetown. "When I was a kid, mining was a big industry," recalls Ray. Those days are gone, but the nostalgia and romance remain. That next pan of gold may contain a big nugget. Ray Little, Paul Bailey and other oldtimers will tell you, "Gold is where you find it."